Your company is collecting more data than ever before; your customers’ pain points, habits, and desires all flow in and out of your business each second. To mine the most value from that data, and to get the answers you need at a competitive speed, you need to employ server solutions powerful enough to handle complex analytics software. 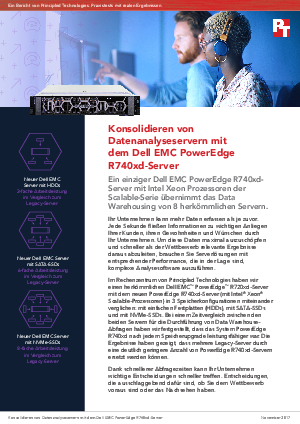 In the Principled Technologies datacenter, we compared a legacy Dell EMC™ PowerEdge™ R720xd powered by Intel® Xeon® Platinum processor’ to the new PowerEdge R740xd (powered by Intel® Xeon® Scalable processors) in three storage configurations: with basic hard drives, with SATA SSDs, and with NVMe SSDs.